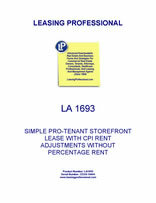 This Storefront Lease (“Lease”) is made as of _________________, by and between COMMERCIAL PROPERTY LANDLORD, INC., a __________________ corporation (“Landlord”), and AGREEABLE STOREFRONT TENANT, INC., a _________________ corporation (“Tenant”). 1.01. In consideration of the agreements and covenants contained in this Lease to be kept and performed by both Landlord and Tenant, Landlord leases to Tenant and Tenant leases from Landlord the Premises described in Paragraph 1.02 of this Lease. 1.02. "Premises" means the retail space commonly known as __________________. The Premises are more particularly described on Exhibit A. 2.01. Tenant is leasing the Premises to operate and conduct a storefront retail business. Tenant may not use the Premises or permit the Premises to be used for any other purpose. Landlord does not represent or warrant that Tenant's permitted business use is presently permitted or will be permitted in the future by applicable regulations. 3.01. The Original Term of this Lease shall be for a period of ten (10) years, beginning on ____________ (the "Commencement Date"), and continuing until _____________. 3.02. Provided that Tenant is not then in default under the terms of this Lease, upon expiration of the term of this Lease as set forth in Section 3.01 of this Lease, Tenant shall have two (2) consecutive options to renew the term of this Lease each for an additional period of five (5) years (the "Extended Term"). Tenant shall exercise each such option by serving notice of Tenant's exercise thereof upon Landlord at least thirty (30) and no more than ninety (90) days prior to the end of the initial term of this Lease as set forth in Section 3.01 of this Lease as the same may be extended. Except as specified in this Section 3.03, all terms of this Lease shall apply fully during the Extended Term. 4.01. (a) Subject to the provisions of Subparagraphs (b) and (c) of this Paragraph, beginning on the Commencement Date and continuing through the entire Original Term and the Extended Term, Tenant shall pay to Landlord an annual Fixed Rent of $___________ in monthly installments of $__________. Tenant shall pay each installment of Fixed Rent on the first day of each month during the Original Term and the Extended Term, beginning on __________. Each monthly installment of Fixed Rent shall be paid in arrears, without prior demand by Landlord, and without deduction or setoff. If Fixed Rent payable under this Lease is abated for any portion of any year pursuant to the terms of this Lease, the amount of the annual installment of Fixed Rent for that year shall be adjusted on a per diem basis calculated on a 360-day year. All rent payable under this Lease shall be paid to Landlord at the address set forth in this Lease for the giving of notice to Landlord (as may be changed from time to time by written notice). Tenant acknowledges that the first installment of Fixed Rent due ____________, shall be in the full amount specified, despite the fact that the part of the month of ___________, included in the Original Term is less than a full month. (b) The annual fixed rent payable under Subparagraph (a) of this Paragraph shall be adjusted as of the first day of the month which includes the fifth anniversary of the Commencement Date and as of every fifth year thereafter as set forth in this Subparagraph (b). Subject to the limitation set forth in Subparagraph (c) of this Paragraph, the annual Fixed Rent shall be adjusted as follows: The Consumer Price Index for All Urban Consumers published by the Bureau of Labor Statistics, United States Department of Labor for all items ("Index") in effect on the Commencement Date shall be the Base Index. On each date specified for adjustment of the Fixed Rent in this Subparagraph, the Index in effect immediately before that date (the "Adjustment Index") shall be used for purposes of calculating the amount of the adjustment, if any. If the Adjustment Index has increased over or decreased from the Base Index, the Fixed Rent payable until the next date specified for the adjustment of Fixed Rent shall be increased or decreased by the same percentage as the Adjustment Index bears to the Base Index. If the Consumer Price Index, as now constituted, compiled, and published, shall cease to be compiled and published during the term of this Lease, or is calculated on a significantly different basis following the date of this Lease, the most comprehensive official Index published that most closely approximates the rate of inflation (or deflation) shall be used for purposes of computing adjustments under this Lease. 4.02. (a) Except for utility services provided by Landlord under Subparagraph (b) of this Paragraph, Tenant shall apply to the appropriate local utility companies to begin service on the Premises on or before the Commencement Date, and shall pay the cost of any required deposit, hook-up fee, metering charge, or other charge by the utility provider. Throughout the term of this Lease, Tenant shall pay, prior to delinquency, the cost of all utilities on the Premises, whether provided by a local utility company or by Landlord. For services separately metered or otherwise separately billed to the Premises, Tenant shall arrange for the local utility company to bill Tenant directly. Should any utility be provided by Landlord, Landlord shall bill Tenant monthly for those services and Tenant shall pay the same at the same time as Tenant pays Fixed Rent. (b) As of the Commencement Date, it is expected that Landlord will provide no utility services to Tenant. Landlord may elect at any time during the term of this Lease to furnish, or to select an agent or independent contractor to furnish, utilities to the Premises and, in that case, the Tenant agrees to accept the furnished utility services to the exclusion of any other provider, provided the charge to Tenant for furnished services is competitive with other providers or has been approved by the appropriate regulatory agency. On at least thirty (30) days prior written notice, Landlord may discontinue furnishing any utility service previously provided to Tenant and in that case, Landlord shall be responsible for connecting the Premises to a new provider, but shall otherwise have no responsibility to toward Tenant. Landlord has no responsibility for any curtailment or suspension of any utility service to the Premises provided by a local utility company, or in the case of any utility provided by Landlord, for any curtailment or suspension necessitated by repairs, action of a public authority, strikes, acts of God or public enemy, other similar causes, or default by Tenant under this Lease. Curtailment or suspension of utility services does not constitute a constructive eviction under this Lease. 4.03. (a) Throughout the term of this Lease, Tenant shall pay, prior to delinquency all real property taxes and special assessments assessed against the Premises. Tenant shall arrange to have all billings for real property taxes and for all assessments not included therein sent directly to Tenant. Should Landlord receive any such billing, Landlord shall immediately deliver the same to Tenant. Tenant shall also arrange, as nearly as possible for informational copies of such billings to be mailed to Landlord. (b) Both Landlord and Tenant shall have the right to contest the amount of any portion of the real property taxes levied against the Premises or to the underlying valuation giving rise to any such assessment. If Landlord receives a refund of any such tax which Tenant has paid Landlord, Landlord shall refund the same to Tenant after first deducting all costs and expenses incurred by Landlord in obtaining such refund, including reasonable attorney fees and reasonable appraiser fees. Landlord shall have no duty to contest the amount of any tax assessed against the Premises. The parties shall coordinate their efforts with regard to any contest described in this paragraph. 4.04. Any monetary sum in addition to Fixed Rent payable by Tenant under this Lease, to Landlord or to others shall be deemed additional rent ("Additional Rent") under this Lease whether or not the same is so designated. Unless otherwise provided, all Additional Rent shall be paid at the same time as Fixed Rent is payable, and Landlord shall have the same remedies for Tenant's failure to pay Additional Rent as Landlord may have for Tenant's failure to pay Fixed Rent.